Home » Uncategorized » The social ethics of scamming – Why am I always getting ripped off in China? It seems that few people manage to escape China without a tale of being conned out of at least a couple dollars. Whether it’s buying goods in Beijing’s silk market at prices 1000% higher than locals would pay, getting tricked into paying additional “fees” at hotels, or having a cabbie take you the long way back to the train station. Today we’re going to be exploring why scamming isn’t seen as an ethical problem in China. While many people think that these scams are simply a result of increased tourism (which is definitely a factor), this does not completely explain its prevalence in the middle kingdom. After all, foreigners aren’t the only ones getting tricked, it may actually be more closely tied to the idea of “waicunren” which we explored yesterday. When a vendor decides just how high to set the price, place is often an important factor. Obviously when it comes to foreigners they don’t usually have to ask, generally speaking vendors see white tourists as the richest, and their clothing often betrays the extent of how true this stereotype is (I once saw a man enter a tourist mall in Beijing wearing an expensive suit and Rolex, it was like bees to honey). When it comes to their fellow Chinese customers though, they only need to exchange a few words before they can establish where the other person is from. This is because nearly every province and city has a slightly different accent that betrays the speaker’s origin. Social ethics kick in at this moment and a person from a more distant place can be fleeced without concern. Let’s say you visit a shop selling tea from Fujian province in Chengdu. They have a base price for those from the city, a lower price for those from Fujian, and a higher price for those from everywhere else. 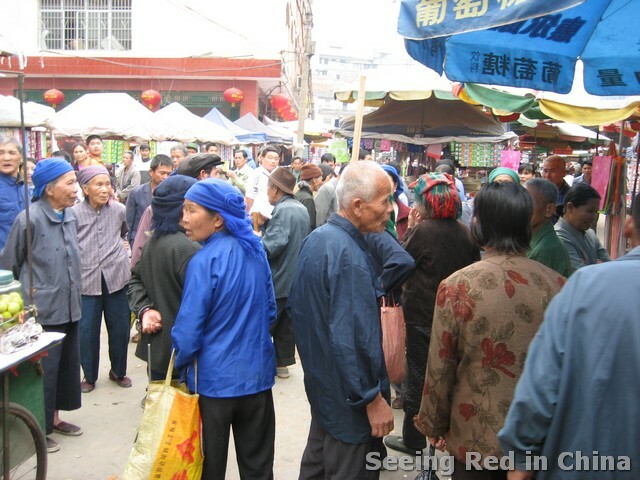 Upon hearing a Fujian accent, they would begin discussing their exact origins, and if a close connection is found, an even deeper discount would be expected. Note: My friend living in Chengdu sees this so often that he encourages all of his students from other provinces to learn a few phrases in the local dialect to save money. Since there is virtually no connection with a foreign country, the vendor is freed from all social expectations, and can extract as much cash as the unwitting “outsider” is willing to part with. The next time your shopping in a tourist heavy area, listen for people discussing place during the bargaining process. This behavior though is not restricted to China’s cities either, it can even be found in China’s cancer villages. Locals realize that their food is completely unsafe to eat, but are unable to exert any control over their environment, so they often sell the heavy-metal laden grain to areas beyond their social circle. This common practice is seen as acceptable (by others in the village) only because they are not harming people from their clan or village, it affects “outsiders” beyond their concern. So again expats, take heart. It’s not only waiguoren being scammed, it’s all of us “outsiders.” And the next time you notice a familiar accent in the market, try telling them you particularly enjoyed the scenic sites of their home town or try convincing them you are a local (dialects come in handy here), the price might just come down once they realize that in some small way, you really are connected. By T in Uncategorized on September 27, 2011 . Since most vendors will assume you can’t speak Chinese, stand around looking at things in a shop where you want to buy something. Be close enough to wherever the salesperson is that you can hear what they’re saying. If they talk to you, pretend you don’t speak Chinese, or say a few Chinese words with really horrible pronunciation and grammar. If you’ve run into a vendor with some sense of shame, this usually allows you to purchase the item for the same price, or an even lower price depending on how hard you want to press the guilt trip. Now, is that kind of exploitative? Sure. But so is over-charging someone based on their nationality . Don’t hate the player, hate the game. The bigger issue with this technique is that depending on where you are, it can require quite a bit of time standing around. On the other hand, trying to bargain sometimes takes just as much time. I recall my first time trying to buy a winter coat in Harbin, it took me three hours going from shop to shop because everyone was giving me prices of 1000-2000 RMB and even bargaining I never got them below 500. (I did finally find one shop that wasn’t trying to scam me and have me a pretty fair quote right out front, lowered further with some bargaining). Thanks for the post, it explains what I’ve suspected for some time, which is that I’m not the only sucker in the marketplace, but I am the most obvious one. “Story of Qiu Ju” – a taxi scams a pregnant women, a writer offers to pen a letter that could get the mayor shot. Several other scenes illustrate the point that friends and family get special treatment, and everyone else is prey. Brilliant post, thanks! China is notorious for its scams (www.scaminfo.org/china), so you are not alone 🙂 Just got to be careful and always bargain, bargain, bargain. Basically, it’s buyer beware. Assume the vendor is lying. This is just the way it is. There are lots of things that bother me about China. But this is at least a process I can understand. C. Custer, I love your “most important rule”! Hahaha! The second most important rule is you never have a true market price unless you walk away at least once during the negotiation. Unfortunately, it takes a while to learn the tricks of the trade. By the time you learn, you are so tired of it, you just don’t want to do it. You want to go buy some scarves for gifts. Anticipate a 2 hour process. Sigh. Not to argue the Chinese “Ethics of scamming people”, but I think in china scamming is more because of a complete incompetence in the Chinese police force and legal system. These people know they can scam people every day and not have to worry about any reprecussion whatsoever. I was recently in Taipei for two weeks, and didn’t even encounter one instance of someone trying to get over on me. I don’t think China is anywhere close to making a law about scamming customers, since they don’t find any ethical problem with the practice. Tom, I kind of agree with Mac. There are certainly laws on food quality. There are laws in Beijing about spitting, riding double on a bicycle, stopping your car before you turn right on a red light, littering, etc. Everyone breaks those rules because there is no penalty flag and they are desperate to survive so they take the risk. Furthermore, government officials’ behavior is not a good moral compass. I see it a bit like a parent who tells the child “do as I say not as I do”. When corrupt officials are ripping off innocent citizens and using their positions for rent seeking activities, you end up with a lot of bad behavior. Lastly, to be a whistle blower in China is a great personal risk. You have no idea what will happen, whether the perpetrator is connected, whether justice will be done. Did everyone read about the whistle blower in Luoyang, Henan who responded to an official government program of rewarding whistle blowing (on tax evaders) and was paid all of one (that’s right! ONE) RMB? Better to just mind your own business, get your own grift going, and try to survive. Yes, Lao, laws are here and the problem is how and in what degree can to be implemented. CPC got in power in a bait and switch scam to start with. Chinese were told that land will be divide fairly, and people will share wealth equally in the new China. And now China has the greatest wealth gap in the world. Happens anywhere else … China , India , Mexico or Europe . Merchants always want to take any advantage … this is business not personal . Great article. Explains why I was able to get better prices once I’d learnt a bit of Chinese and indeed the local Xiaoshan dialect. What you describe in para 1 & 2 is and has always been the case in the majority of Arab countries. Where the average guy in the street is living close to the proverty line, while ‘tourists’ parade in front of him spending a week’s wages on lunch, it is seems as prowess to ‘trick’ them if they are ‘stupid’ enough to fall for it – it’s also a matter of necessity when you like so close to proverty …. This lies at the heart of the matter, and stretches way beyond the dynamics of bargaining. Put simply, there is a greater acceptance among Chinese of practices that might be deemed ethically questionable in other cultures. This is particularly true, of course, where there is some advantage to be gained, be it financial, academic, political, status or career-related. And the broader point is well made, too. Namely, that the further removed from an individual’s familial, hometown, province, or country ties one is, the greater the level of acceptance – and likelihood of – getting royally shafted. On a micro level it’s the vendor selling a 300ml bottle of water to an American tourist for 50 kuai; on a macro level it’s China telling WTO member states it will clean up its copyright infringement act with no intention of doing anything.